In a city that flourishes on their attractions, you may find it difficult to get around. If you have a car it will be slightly easier, but then you are faced with a new challenge – FL traffic! While you always have the option of taking public transportation to your destinations, it is not recommended. Unless you enjoy standing in the triple digit heat with 100% humidity and waiting for a bus that is running 20 minutes late, then driving your own or rented vehicle is the optimal choice. The commuter traffic in Orlando, Florida was recently ranked as the 4th worst place to travel in the country – especially during rush hour. By all means try to avoid driving from 7am to 10am and 4pm to 7pm, including weekends! When you add tourists to the mix, traffic becomes a nightmare. Local drivers get frustrated at the tourist drivers are not a hundred percent sure where they are going, and the tourists get frustrated at the residents for not being more patient and understanding. Whoever’s side you belong on, drive safely if you want to steer clear of having to go to a online traffic school to dismiss a ticket. •	Plan your trip during the slow season, which include favorite holidays: Thanksgiving and Christmas as well as the first two weeks in January. The park’s attendance is at its lowest during these times. Not only will you avoid a lot of traffic, you will not have to wait as long to get into the park, or on the rides, or get in to see the attractions. Visiting during this time period is pretty much a win/win if you can arrange it. 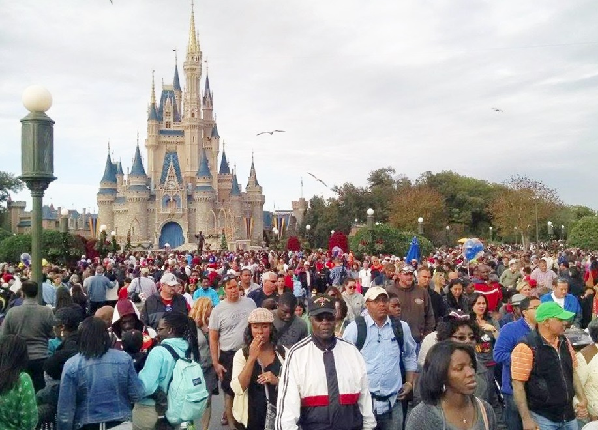 •	Your best bet for avoiding traffic is to stay at one of the hotels owned by Disney. The hotels and resorts all provide transportation to and from the airport and to the front gate of the park, avoiding all the traffic. The transportation is reliable, clean and air conditioned, making it a more enjoyable experience for everyone. The only one small downside may occur if the resort or hotel is busy. Then you may have to wait a little while to get on a shuttle- but at least you can wait inside with the hotel’s air conditioner! Getting from park to park is fairly easy and quick because Disney has a network of buses, boats and the monorail system. But inside the park is a different story! Foot traffic can be almost as frustrating as vehicle traffic. Basically, once inside Disney World you will have to be patient and observant. You will need to be extra cognizant of people standing in the middle of the walkway who stopped to take pictures, little ones who love to zip zag while walking, and others who just tend to walk extra slowly. The best tip: carry a map marked with all the attractions and rides you want to visit first. This way, you can avoid getting lost, bumping into tourist traps and spending your day running back and forth from one end to the other.